Reformers of the 1910s would not have believed anyone who predicted that sawdust floors would make a comeback later in the century. But come back they did. 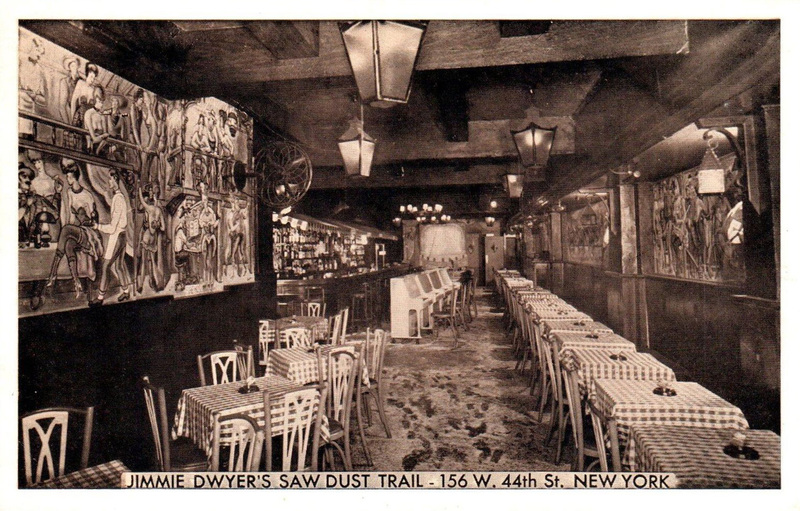 In the early 20th century, sawdust floors were seen as a vestige of disappearing filthy low-class eating places. 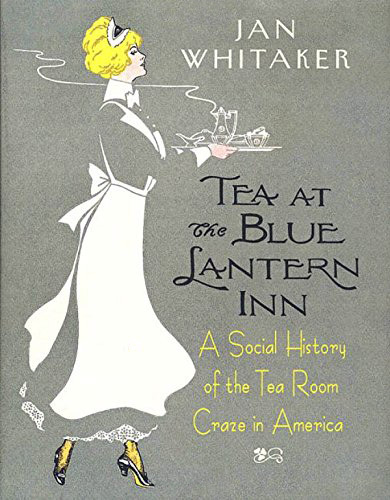 Earlier they had been found in a great variety of places – English chop houses, French bistros, German, Italian, and Chinese restaurants, and saloons of every kind. In New York sawdust dealers of the 1880s made daily rounds selling 25-cent barrels to restaurants, saloons, and butcher shops (where sawdust collected blood). City health departments warned that cheap lunch rooms of the old sort rarely replaced sawdust, often covering one dirty layer with another and rarely cleaning the wood flooring below. And that was another thing about sawdust floors – they tended to catch on fire when cigar and cigarette butts were dropped on them. 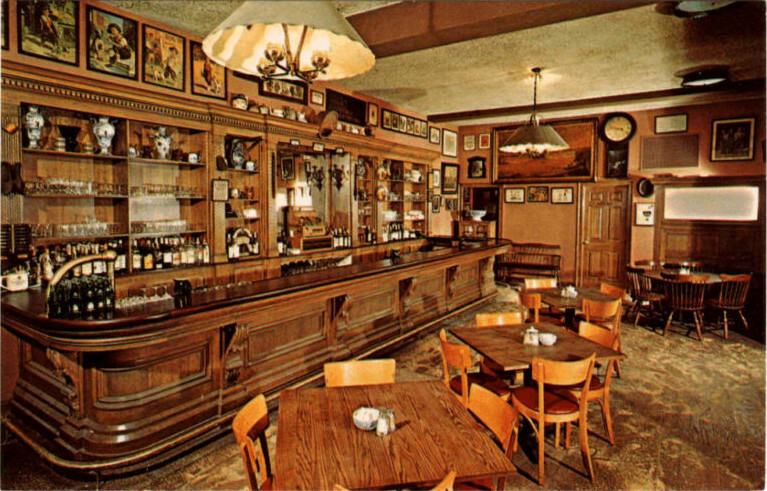 Through the decades sawdust floors acquired strong associations with beef and beer – and male patrons. These associations formed a reservoir of meaning that theme restaurants of the future were destined to draw upon. Steak houses were especially attracted to the winning beef-beer-men combination. The first inklings of sawdust’s return came with the legalization of beer in 1933. The Palm steak house in Manhattan, a man’s restaurant frequented by newspapermen, was one to use it. 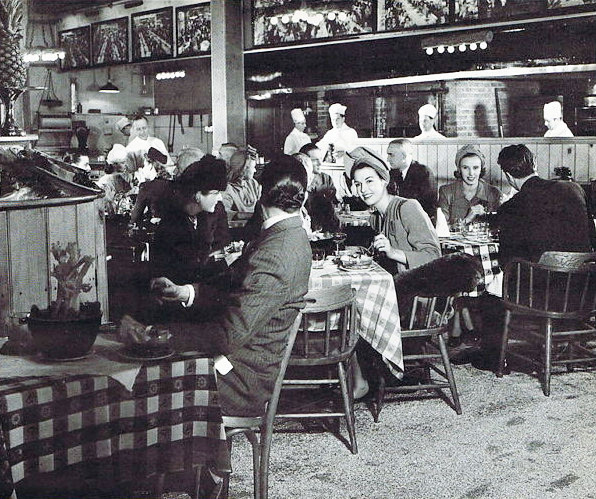 Steak houses were so strongly associated with men that it was newsworthy in 1947 when a woman restaurateur departed from their standard rough-edged ambiance which she characterized as “A smoke-filled room, too-bright lights and sawdust on the floor.” In order to please women customers, she instead chose oak paneling, sound-proofed ceilings, soft lighting, and window boxes with green plants. Unsurprisingly, she did not start a trend. 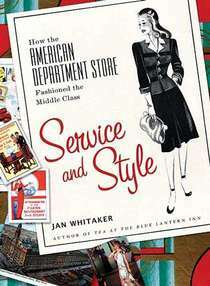 By the 1960s, if not earlier, the bad old days had been transformed into cheery “bygone days” when life was truer and simpler. 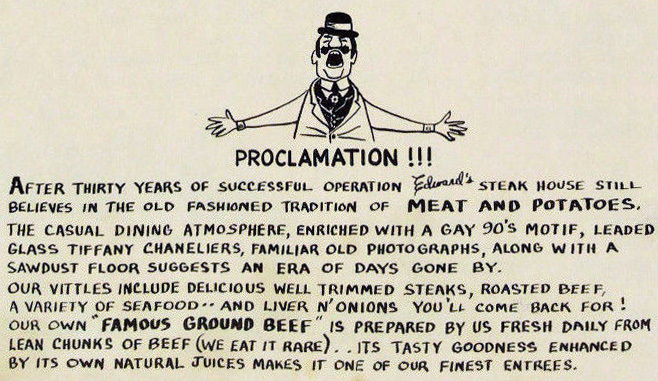 Americans of the era hungered for amusement with their meat. “Historic decor, the chef who cooks his steaks on a bed spring or an anvil, and the place where ‘famous people dine there’ . . . all offer that ‘something extra’ a man needs to draw him out,” observed industry consultant George Wenzel, who also recommended sawdust floors. Restaurants with sawdust floors proliferated, many adopting other nostalgic (might we say hackneyed?) decor features such as red-checkered tablecloths, gas lights, pseudo-Tiffany lamps, pot-bellied stoves, and elaborate dark wood bars. 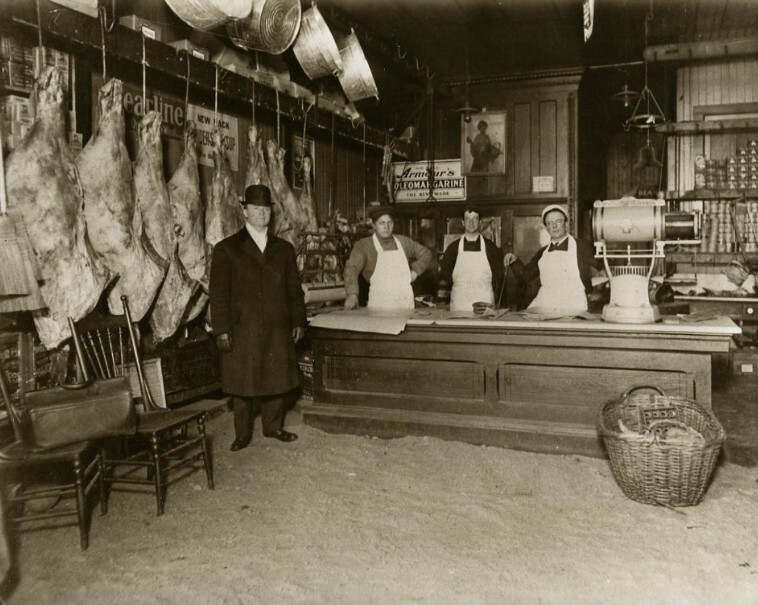 O’Henry’s in NYC used a “fun” butcher shop theme, with real carcass hooks hanging from the ceiling and butcher blocks for tables. In Phoenix AZ the notion of a “hole in the wall” was redeemed from the ash pit of history by a 1970s resort where everything in sight was designed to appeal to men. At the resort’s café named The Hole in the Wall there was sawdust on the floor, tintypes on the wall, fires in the fireplaces, mugs of beer, and a manly menu of beef and buffalo steaks, rattlesnake meat, “cowboy beans,” and corn on the cob. Along with steak houses, versatile sawdust floors turned up at Gay Nineties restaurants, English pubs, Wild West eateries, barbecue joints, even Mexican restaurants. It’s hard to figure just how many states and municipalities issued ordinances prohibiting sawdust floors. In 1976 the federal Food and Drug Administration banned sawdust in restaurants, yet the ban was not universally followed. Sawdust floors were permitted in San Francisco, but not in Washington, D.C., for instance. Some restaurant owners strenuously resisted health departments that advocated for a ban. In Arizona, the battle over sawdust became intense when state and county health departments cracked down on several dozen restaurants in Phoenix. The restaurants countered that they replaced sawdust daily and had never experienced problems with patrons becoming ill.
Today? I believe that restaurants are not allowed to use sawdust on the floors in the U.S. today – but I am not 100% sure about this. It seems that patrons who still long for that kind of atmosphere must content themselves with throwing peanut shells on the floor. Philipe’s restaurant in Los Angeles, home of the French Dipped Sandwich, continues to have sawdust on the floor. 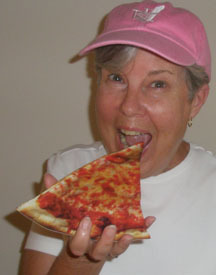 Founded in 1908, they relocated to their current location in 1951. Philipe’s claims to be where the French Dipped Sandwich was invented, a fact disputed by Cole’s Restaurant a few miles away. Thanks for another great post. NYC sawdust floors that come to mind: Molly’s, and McSorley’s. Yes, The Dead Rabbit does as well! I so enjoy your pieces. In this case, I remember quite well as a young girl in the 80s, my parents taking us to a restaurant, possibly in Delaware, and I was really intrigued by the sawdust on the floor. My parents, who always provided great background on our experiences, explained a bit about why it was there and how unusual this was. I’ll be sure to share this with them. Thank you, as always! I seem to recall going to some kind of restaurant in Chicago back in the early 70s that had a sawdust floor. Can’t remember the name of it though. Interesting as always. Don’t remember working on sawdust floors. Maybe my age is showing? Blessings!! P.S. Really glad to be living in Chicago again! !